"Your tool is well engineered and holds up to a great deal of stress. This includes a recent ceiling with a one inch layer of 80 year old cemetitious plaster. My need for a tool started at Home Depot where their tool, unlike yours, almost caused serious harm to my employee. 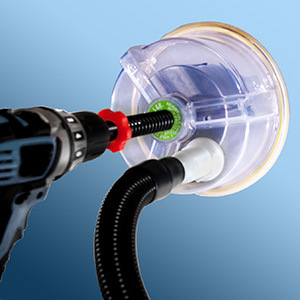 After an internet search for hole saws for ceiling speakers i came your DrillSpot site. I quickly ordered your tool regardless of price. For a builder fewer things are as satisfying as a tool exceeding one's expectations. I even built a special box to hold your tool and the accessories. Thanks to the inventor of your hole saw for coming up with such a great device. " "Hi, Just wanted to let you know that we are absolutely thrilled with the hole cutter. Wow, did it make the job easy. We cut eight 8-1/4 inch holes in plywood overhead that took less than an hour to complete. Awesome!" "Finally a tool that cuts through plaster like butter without the usual chipping and cracking. Remodel recessed lighting has never been better with this tool. Very sturdy construction as well as sharp blades. Look forward to using this every time!" "It will save you time and money, plus provide exact size holes every time." "Wish I had one of these years ago. Makes life alot easier. Thank you guys." "It's a wonderful product this will cut down 65% of my time thanks so much"
"The X-305 I bought is great. Perfect, custom sized holes with controllable punch through. Works really fast and the mess is contained. Thanks." "I have had great success with the product. It works wonderfully... two contractors watched me make perfect holes in knotty pine ceiling that took them 10 times the time/effort and caused peripheral damage said they were going to order ones the next day. Thanks again." "I cut 9 holes in drywall. 3 at 3?, 4 at 6.5?, 2 at 9.5?. It was wonderful. Clean cuts and clean hair! All my workmen love the product." "The X-230 Works great. 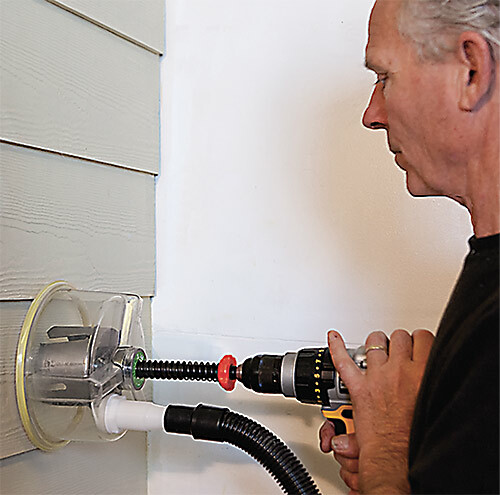 Hardi cement board can be a bear to cut, but this tool makes the job very easy." "Thanks so much for the Great product! This is the 2nd one I have purchased this year. We install pellet stoves and it works great . I have two crews installing and they where fighting over the hole cutter so this is why I purchased a second one." "We use the X-305 to install ceiling speakers in our whole house music systems. We get perfect holes for our 8" speakers with no dust! In fact, we have installed speakers in furnished houses without even moving the furniture, the X-305 is that clean. We just leave the speaker wires in the ceiling, let the drywall guys finish, paint, and then we cut. Perfect every time!" For stainless steel, sheet metal, cast iron, copper, aluminum, brass, steel plate, sheet metal, fiberglass, FRP materials, etc. Tungsten Carbide Tipped for Stucco, FRP, Fiberglass Cuts OSB and Plywood sheathing too! Unique 5/8-18 thread mount for use with supplied 7/16 shank or with standard hole saw arbors, extensions, and quick release adapters. 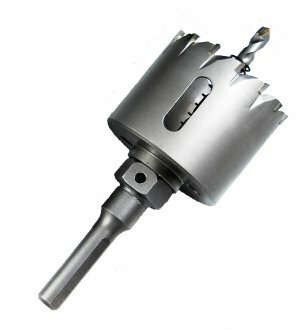 Removable pilot bit is a standard 1/4" diameter for easy replacement in the field unlike other carbide hole cutters which require special 6mm pilot bits. 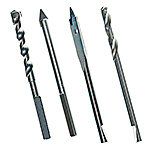 Blue Boar Stucco & Fiberglass hole saws are engineered with special ultra hard TCT tungsten carbide tips and have an innovative tip design able to cut through stucco, and then continue cutting through plywood sheathing using the same bit. Different models quickly and easily cut from 1 7/8" up to 17" inch diameter holes in walls, ceilings, and floors, cutting through plywood, MDF, OSB, acrylic, fiberglass, fiber cement board and many other materials. 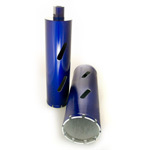 One adjustable hole cutter can replace dozens of conventional cup style hole saws and provide the exact hole size needed.